Whatever it takes to get them squeaky clean and down to bare base metal. To do the initial clean/degrease/remove paint, etc. I use bulk carburetor cleaner, the kind that comes in a gallon can (or larger) and includes a dipping basket. For derusting, I use a vibratory tumbler w/rust cutting media. It takes a while, 12-36 hours, depending on how rusty the parts are, but there's ZERO manual labor involved , and the parts come out great. If there's tight spots that the tumbling doesn't get in to, then beadblasting gets the rest of it. For heavily rusted, or large items, I use electrolysis, with washing soda. Works great. An acid pickle, just before plating, takes care of any minute rust. Last edited by seanc; 01-26-2009, 08:15 AM. ZERO labor is the key word. I hadn't thought of a tumbler, harbor freight here I come!! I got a steel basket from mcmaster carr($12) and hope it will work by just dumping them in and mixing them a few times during the process. I've been down the road you're thinking of, maybe my experience can send you in a better direction. There's a few reasons why a dipping basket like you're thinking of aren't suitable. 1) They have HUGE amounts of surface area which you have to include in your current calculations. If it's the one I think at McMasters (#32525K35 ? ), I roughly calculate that basket at @ 145 sq-in.! The basket alone will need 7-14 amps! 2) the walls of the basket are going to draw the majority of the plating current, and will in effect, shield the parts inside the basket. They won't plate well unless the current has a free path to them. 3) since you're plating the basket along with the parts it contains, you waste a lot of anode on it! (as well as excess electricity). That tiny little 3 x 5 piece of screen mesh was 22 sq-in! It worked well enough as a "shaker", if the parts were able to shift around easily, but bolts tend to "lock up" against each other and it's difficult to get them tumbled about adequately. That's why I attempted to build a rotating barrel to auto-tumble the parts. Last edited by seanc; 01-26-2009, 08:17 AM. I've tried the basket thing too and it sucked, hard to rinse too. I know you are doing copy cad and this doesn't apply, but the shaker basket isn't worth a **** in the nickel because you temp loose connection with the part and it wont plate well. 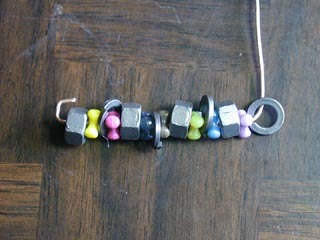 When I do nuts and bolts, I thread the nuts on a wire with plastic beads in between each one. 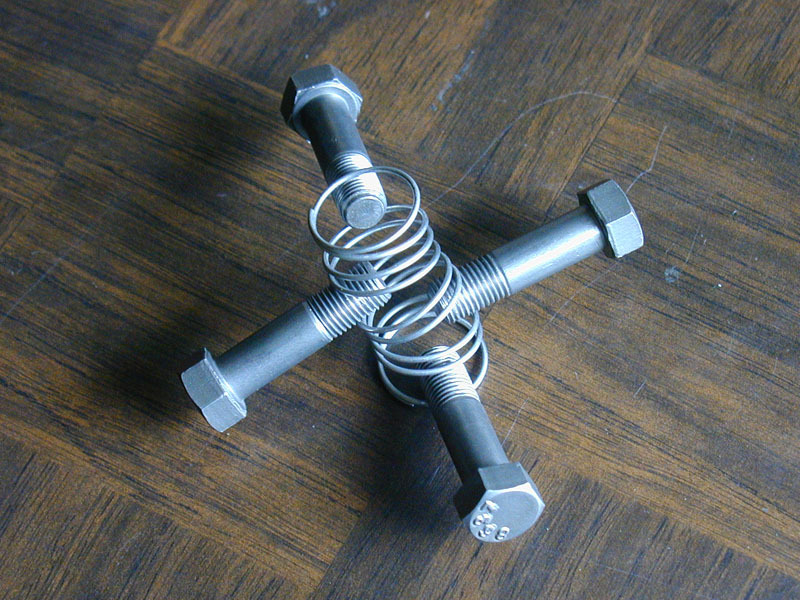 Bolts, I take a long piece of wire, and wrap once around each bolt on the threaded area usually alternating the direction of the heads for balance. When I'm finished it looks like a string of popcorn. Pictures link to larger images. I've done the plastic bead thing too. It works good for small batches of parts. Wiring up bolts individually is a royal pain though, so I tried a spring "rack", and IT works good too. See next post. Forum won't let me post more than 2 photos per message. Last edited by seanc; 01-26-2009, 08:19 AM. But it's just too time consuming to do a high parts count this way. For anything more than a small handful, a barrel is the best solution. Last edited by seanc; 01-26-2009, 08:20 AM. i love your barrell design, i've been looking for something similar... i have one question, though... how do you wire it up for the power? and how often do you rotate it? i have the round buckets, so i guess i'll have to modify it a bit. how do you wire it up for the power? and how often do you rotate it? i have the round buckets, so i guess i'll have to modify it a bit. I use a stainless steel rod and dangle it in the basket on top of the parts. I've also used an old SS butter knife. Still need to figure out how to mount the electrical connection permanently though. I figure anything around 3-6 RPM works. Haven't yet found a strong motor that slow, so I'm still turning it manually. Every 15-30 seconds I'll turn it over. I still haven't worked out all the kinks though. Just haven't had the time since last fall. This may sound dumb, but how do you ensure that the SS rod or butter knife is in contact with all the parts all the time? Does it just touch one, and they then touch each other? i am using the copper, and nickel kits, so i'm assuming, i'd do the same thing with the copper wire, or a copper pipe? This may sound dumb, but how do you ensure that the SS rod or butter knife is in contact with all the parts all the time? Well, those are the "kinks" I haven't worked out entirely. Particularly a mounting which would hold the rod in just the right position all the time. It really needs to be spring loaded so it can shift position with the parts as they tumble. Some large commercial plating barrels use this method. They call it a "dangler". Some danglers are large balls which simply ride on top of the parts pile. 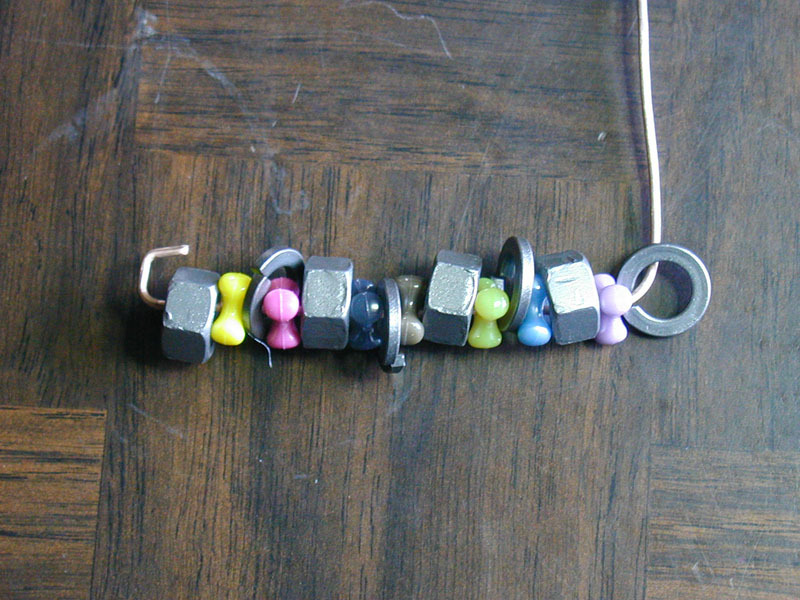 Others are thin rods which get surrounded by the parts. Of course, they are complicated devices using slip rings for electrical contact, while I'm trying to keep it simple. The tradeoffs aren't as easy to overcome as I figured. Does it just touch one, and they then touch each other? Don't know how well this would work for nickle or copper. The current in zinc is fairly low, so it passes through the parts easily. 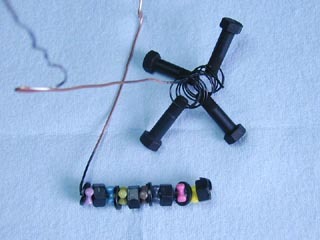 You might try the motors they use for making fishing rods. I built a rod making set up and the little motor seems as though it would have enough torque and turns pretty slow. I think it would turn your plastic basket. You might try the motors they use for making fishing rods. I'm not familiar with making fishing rods. Sounds interesting. However, I have the ideal motor now: barbeque rotisserie motor. They turn at just the right speed, 4 RPM, have gobs of torque, and are designed for continuous use. I have it set up for motorized use now, but still haven't quite got a fool-proof electrical connection to the parts, so haven't posted an update. When I figure that out, I'll be posting a full update. It's not perfect, and I continue to investigate improvements, but if you can adapt the design to your own needs, go for it & post the results! Last edited by seanc; 01-26-2009, 08:21 AM.